Hack Facebook Via Phishing. | Kanishk's Technical Blog. Today,I'll tell you about Simple Facebook Phishing.As many of the readers are learning about Facebook Phishing for the first time,I want you to know what is Phishing first. You'll Need Some Files and Some other things for this Tutorial. 1. Three Facebook Phishing Files. 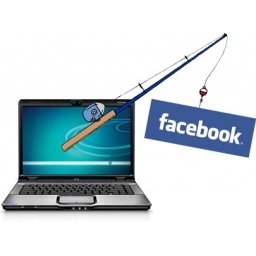 To Download Facebook Phishing Click Here. 1. Now after downloading the Facebook Phishing Files,Upload them to any Web-Hosting Site. Note: I am using My3gb.com for this tutorial. 2. Now Upload the three files to the Web-Hosting Site's File Manager. 3.) Now,To See the Fake Page,click on the Index.html file and a New Fake Facebook Page will Open. You Can easily spot genuine pages by spotting the term HTTPS (Hyper Text Transfer Protocol Secure). Fake Pages don't have HTTPS Term. 4.) Now,Copy the URL you see in the Address Bar when you see the Fake Page. 5.) Now,Go to any URL Shortner like This. 6.) Paste the link Of your Facebook Fake page there and now it'll give you a short URL for it. 7.) Now,Copy the Shortened Fake URL and Email it to the Victim. "When you log in through this Facebook Page You can set theme to your profile like Orkut." "We are Facebook Authorities and We have noticed some unusual movements in your account and need to verify your account.To Verify Your Account Go to the Below URL. <Your Face URL Here>"
9.) Now,After your Victim enters his Facebook Email and Password on your Facebook Page.Its Time to check the Log.TXT file. 10.) Go to your Web-Hosting account's File Manager and view the LOG.TXT file from there. Open the Text file and You'll find their Email ID and Password. I hope You Find this Info Useful.This Facebook Phishing is not only for teaching to Hack accounts but is also for being protected against it.Now that you've read it,You can stay protected against it. To Learn How to Post Phishing Page URLs to Facebook, Click Here.